Driving Master Danny: Hot. Cool. Yours. With only 20 days to go till Opening Ceremonies for XXII Winter Olympic Games, I'm starting to get Sochi Fever. I have compiled a list of interesting facts about the upcoming games and its host city (besides being the resort where my parents spent their honeymoon). 1. There are 17 days of competitions during the XXII Winter Olympic Games, 7-23 February, 2014. 2. 11 new world-class sport complexes where built in Sochi, together they have around 120,000 seats. 3. 98 medals will be awarded. It is 12 medals more than was awarded in Vancouver in 2010. 4. Each medal took 18 hours to produce and all the metals were mined in Russia (gold, silver, copper and zinc for bronze). 5. 3,500 athletes will compete in the Games representing 88 countries. They arrive with over 3,000 support staff in tow. 7. 25,000 volunteers will be working at the Games. 8. 130,000 members of the press were issues credentials for the Games. 10. The opening and closing ceremonies will be in the Fisht Stadium that seats 40,000 spectators. The structure is permanent and will be used for as a training facility for the Russian national football team and to host entertainment events after the games are over. 11. 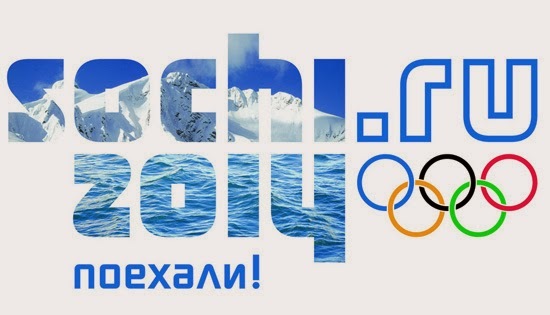 Sochi 2014 logo is the only Olympic logo that includes a web address. 12. The Sochi Olympic Games torch relay is the longest relay in Olympic history. The torch has visited the North Pole on a nuclear icebreaker, hung out in outer space for 5 days, topped the highest mountain in Europe – Mount Elbrus, and dove to the bottom of Lake Baikal – the deepest lake in the world. In Russia, the torch will travel across all 83 regions. 13. The torch was created in a missle/rocket factory and has failed at least 44 times. The factory is now under criminal investigation, ordered by Putin. 14. The Olympic mascots are: Misha the Polar Bear, a White Hair, and a Snow Leopard. The bear is a symbol of Russia, all bears are nicknamed Misha, a term of endearment. 16. There are only 29 luxury hotels in the area. So unless you know an oligarch with a private villa you're out of luck. 17. In 1980, Moscow hosted the XXII Summer Olympic Games, Sochi will host the XXII Winter Olympic Games. 19. About 430,000 people (representing over 100 nationalities) live in Sochi and its surrounding villages. 20. Sochi boasts a unique mix of subtropical and mountain climates. Average temperatures in winter are low 50s. Average snow depth in the mountains is 6.5 feet. "You can sunbathe by the Black Sea in the morning and ski the West Caucasus in the afternoon," is how Sochi often described. 21. There will be snow! It is personally guaranteed by Putin and they have been stockpiling snow for the past 3 years. The stored snow is chemically treated and will appear grey on television. 22. There will not be a cloud in the sky. Russia is extremely fond of using cloud seeding, a method of dispersing clouds by pulverizing them with anything from carbon dioxide to bags of concrete. God help them.